Welcome to another year of celebrating all that is piratey! Pillaging, plundering, and singing charming sea chanties. I'm participating in a Blog Hop with my bento buddies again so be sure to click on the flag at the end of the post to see the next epic lunch! Now check out what my shipmate Karen has for you over at What's In Our Lunch Bags? Wow! 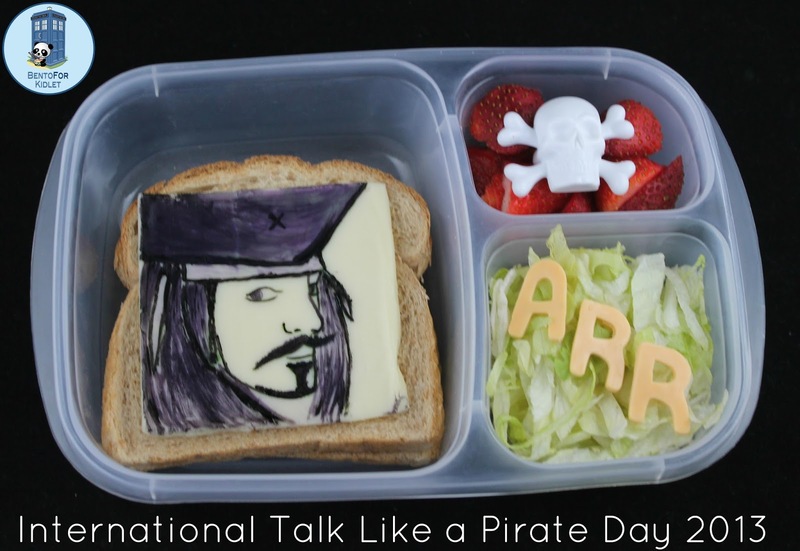 Your pirate drawn on cheese looks absolutely amazing. Well done! Stunning pirate portrait! Fantastic lunch! Holy buccaneer!! That is just about the most amazing thing EVER!!!! Ha! It's incredible! LOVE the pirate! That pirate ROCKS! You are awesome, Matey! Wow, your drawing skills are out of this world. And you drew on cheese (mind blown) You rock!! Um!!!! Wow! Your lunch making talents leave me speechless! This is truly amazing! Awesome drawing! Super love it! Woooow!!! Love your pirate so REAL! Incredible. Your skill is amazing! Johnny Depp has never looked so good!! Yum!!! Amazing! Your cheese art is off the hook! This is awesome! You are so talented.